“The Illuminating Power of Faith.” Please join our guest preacher the powerful Rev. 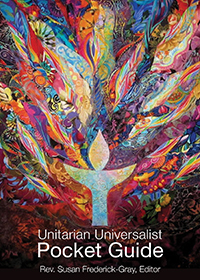 Deborah Lee, and the members, friends, and allies of the First Unitarian Church of Oakland as we faithfully and prayerfully kickoff our 2019 stewardship campaign, “Faith On Fire.” Pastor Jacqueline, Worship Associate Erika and Trustees Rinda Bartley will help hold the container for a spirit filled worship experience. We will be fired up by the soulful music of Crescendo Choir and Joyful Noise. Invite your neighbors and anyone longing to be in community. This is a multigenerational service. Let us be together. All are welcome. Rev. Lee has worked at the intersection of faith and social justice for over 25 years in popular education, community organizing and advocacy connecting issues of race, gender, economic justice, anti-militarism, LGBTQ inclusion, and immigrant rights. She has consistently sought to strengthen the voice and role of faith communities in today’s social movements. Rev. Lee is the daughter of immigrants and part of the Chinese diaspora that has taken her family through Southeast Asia, Mexico and now the United States. She is a proud parent, partner, soccer player and tai chi practitioner.